How could I not use this illustration for this week's word? Here is my myopic chihuahua! Too cute. I know just how Emma feels. 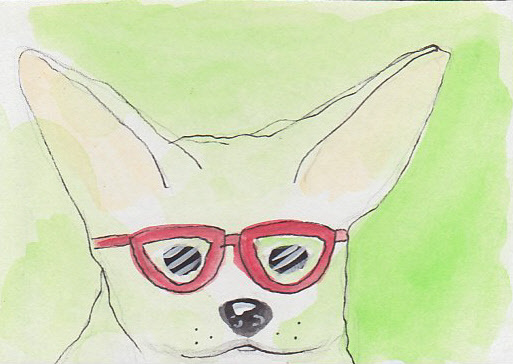 LOVE Anne Lamott, love your chihuahua, and love YOU! Ha ha how funny, but the BEST is that super duper bully header- you know how I love them. I got a good laugh at the poor embarassed bull dog, trying to do an impression of the Easter Bunny. I can swim and the depiction of laying back in a nice calm inlet was rejuvinating.